Posted on March 20, 2013 by Philip O'Hanlon. Perfectly timed snow storm that day made the listening session even more enjoyable in a room cozied up with music lovers and audiophiles sharing a common passion. 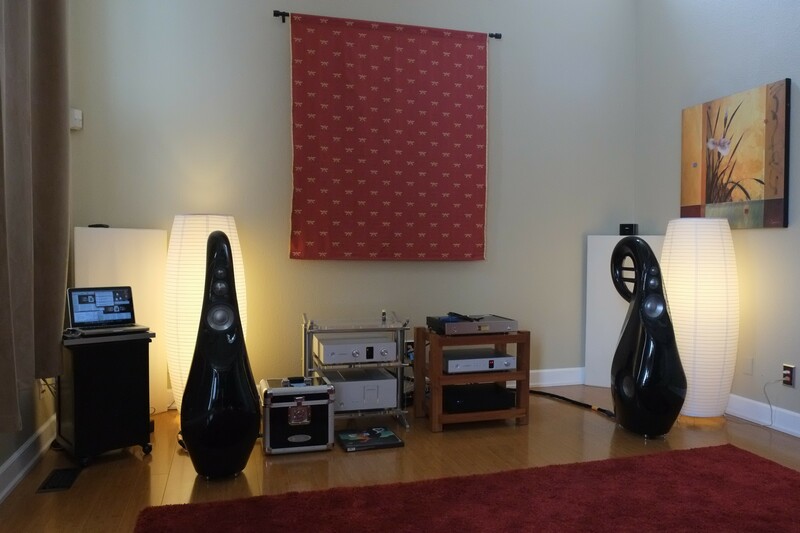 We sampled LUXMAN DA-06 DAC and high rez PCM & DSD vinyl drops with Vivid Audio’s G3 loudspeakers, Luxman C-600f and M-600A. Unfortunately the stylus for our Brinkmann turntable broke and I did not have a spare one so we would have to wait to play original records when I return next. However, we did a USB cable shootout. All the cables we initially played (Luxman USB, Belden USB wrapped in Stillpoints ERS, Wireworld Starlight USB) were unfortunately uniformly monochromatic with regards to their tonal color. It was only when we used Wireworld Platinum Starlight USB Reference cable that we finally heard the tonal color our system was capable of. That was a clear winner! Mike Garner has posted in his blog with further details. Thanks Mike for hosting! This entry was posted in Show Reports and tagged C-600f, DA-06, Giya G3, Luxman, M-600A, Vivid Audio, Vivid Giya.